Reuters/ Tens of thousands of Christians fled to Erbil when ISIS overran the Nineveh Plain in 2014. 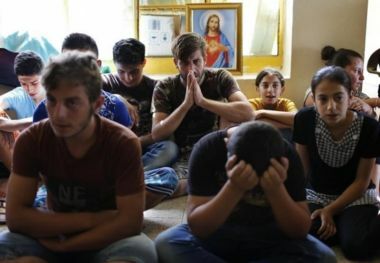 Exactly two years since ISIS militants forced 50,000 Christians to flee Qaraqosh in northern Iraq, three young priests from the city were ordained in a refugee camp in Erbil, and want to bring hope to the persecuted. Around 1,500 people gathered in a church inside the Aishty 2 camp on Friday, where more than 5,000 people are living after being forced from their homes by Islamic State. Fr Roni Salim Momika, Fr Emad and Fr Petros were ordained as priests of the Syriac-Catholic Church. “We left Qaraqosh during this time two years ago,” Fr Momika told Catholic News Agency, adding that it has been a time of challenge and sadness for Christians in Iraq. “Before it was a bad day because we became refugees and ISIS entered to Qaraqosh, but now this day became a good day because it’s our ordination and we give hope to our people,” he said. Fr Momika has for the past two years been working with young people and women in the refugee camp, and hopes to continue his work there. He wants “to stand with the refugees,” he said. His role, he added, is “to give Christ to the people”, and instil “power, hope and courage” to Christians who have endured persecution and suffering at the hands of ISIS. Before the militants overran the city in 2014, Qaraqosh was hope to Iraq’s largest Christian community, with at least a quarter of the country’s Christian population living in the city and its surrounding towns.